Another belated post about a comic release! No wonder I'm still nowhere near making my first comics million... 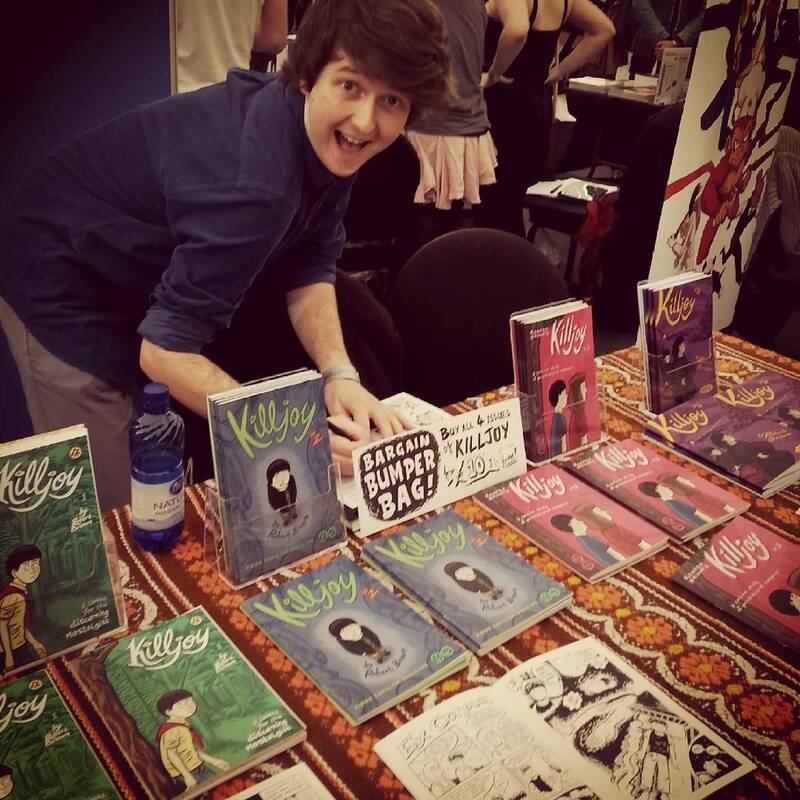 The Thought Bubble Festival 2015 convention (14-15 Nov), at which I released Killjoy #4, was great fun, as always. The other half of the table at which I was seated had not been allocated, so I ended up having a whole table to myself - which was quite fortuitous, given that it turned out that arranging four comics in my usual fashion required the extra space. As always, thanks to everyone who dropped by the table, both pre-planned visitors and impromptu tarriers. It seemed that I encountered more familiar faces than ever before. (Initially I thought it seemed that people were especially chatty this year; eventually I had three long overlapping conversations with visitors to the table, and suddenly realised that I was the garrulous one. Whatever happened to my misanthropic aloofness?) I broke the three-figure mark in takings over the weekend, which I suppose is pretty good for an unknown solely hawking issues of black-and-white childhood memoir comics. I still can't bring myself to make any other merchandise. The week before, I attended the opening of Orbital Comics' Underneath exhibition, to which Camila had invited me to contribute a piece. In line with the theme of influences & inspirations, I drew a page inspired by Chris Reynolds' Mauretania Comics (especially the story 'Whisper in the Shadows', which is collected in his incomparable Adventures from Mauretania), with his blessing. I exhibited the original art, which I'd not intended to sell, but after a rather fumbling (on my part) negotiation with one of the attendees, I received financial compensation for rehoming it. The show was excellent - thanks for asking me along for the ride, Camila! - and I hope you had the chance to check it out. 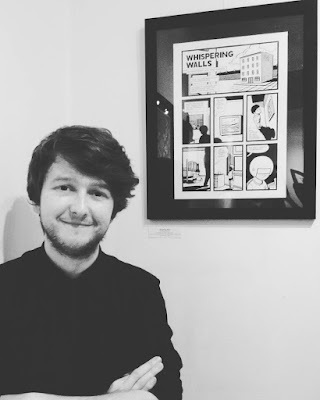 I plan to publish my piece, 'Whispering Walls', on this site at some point in the near future. Did I ever tell you that I occasionally do things that aren't (directly) related to comics? One of those things is messing about with video cameras. 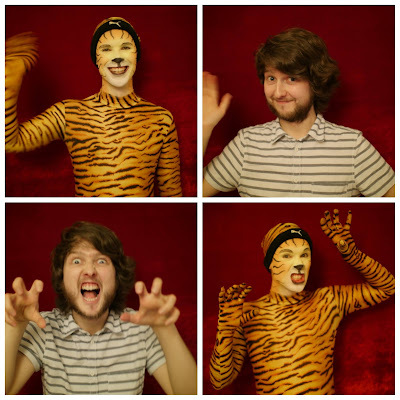 After plans for shooting scenes for my own film project fell through, my pal Gareth Cutter & I decided to have a bit of fun, one Saturday in February, with a tiger character/costume he's explored in previous performances. We intend to build upon the footage shot with some more semi-improvised material to cobble together into a short film. Watch this space (but not too intently). At the time of writing, I've just recently undergone a particularly trying home-move (hell, they're always trying) & am preparing to get back into the cartooning groove. Stocks of the 'historic' first edition of Killjoy #1 (printed way back in 2011) are finally dwindling, and so I'm planning a redux edition to build upon the original material & commemorate the fifth anniversary of its release. Thereafter, I'll be planning Killjoy #5, a return to the issue-length story format to cover the events of late summer '97. Before all that, though, I'm going to be working on a strip for the the Histories of Violence project, with Sean Michael Wilson & Brad Evans, about the theories of Michel Foucault. (I previously provided a cover for Hannah Arendt: The Banality of Evil.) Busy-ish times ahead.